Do you need help knowing when your algebraic working is correct? Then Algy 2 is just what you are looking for. Algy 2 is able to pinpoint any line of working that contains an error. 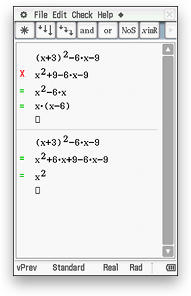 This application encourages experimentation and perseverance with symbolic manipulation (algebra). 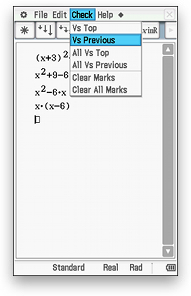 Users simply enter mathematical 'working' into Algy 2 as they would on paper - no computer syntax is involved. Algy 2 will then check the logic of the 'working' and provide immediate feedback to the user, pinpointing which line(s) of the working have a mathematical error. The user can then edit and recheck their working. Try Algy 2 for yourself. 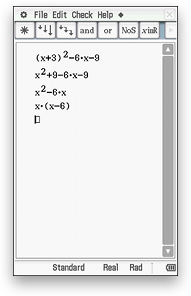 Enter in some algebraic working. Ask Algy 2 to check each line of working. 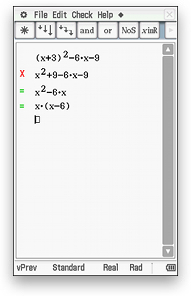 Algy 2 will place a cross for a line that contains an error, and an = sign for a line that is correct. Please note, ALGY has been designed not to provide the answer to the problem. This can be done in other applications on the ClassPad. You can then rule it off (by tapping *) and start a new problem (or redo the same one).